Following a 26 year RAF career as a navigator on Tornado bombers and fighters, interspersed with tours in intelligence and at the Fast Jet Test Squadron, the author is currently working as an ­aviation consultant, mainly in aviation safety management and electronic warfare. In writing this essay, he was greatly assisted by his wife, a trained psychologist. The question has been asked as to how we can continue to conduct operations in a degraded electromagnetic environment; this paper puts forward a view of how the command chain can help tactical aircraft crews operating under such conditions to make decisions that accord with the Commander’s Intent. And it should be acknowledged that this paper proffers that no new equipment or technology is required to do so. 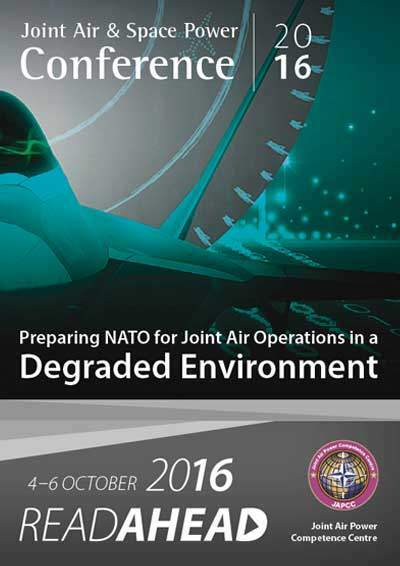 This paper will consider operations in a ‘middle ground degraded environment’ where electronic attack on NATO systems and sensors is ­effected using ‘conventional’ jamming aids and spectrum denial means against those air systems operating in the tactical scenario. In such a ­scenario the loss of systems, situational awareness, and inputs from other friendlies leads to a worsening state of isolation for the crews involved who are forced into making decisions as to the execution of their mission in a highly stressed environment. Degraded operations are really an attack on the opponent’s ability to ­access tactically useful data through the electromagnetic environment. The obvious targets of such an attack are Command and Control (C2), Situa­tional Awareness (SA), weapons and sensors. The operational pilot has to consider at each stage of such an attack whether a go/no-go decision is required and, assuming a ‘go’, how can they complete their element of the mission. or degradation of, own-ship sensors. In isolation each of these will be significant. Cumulatively the impact on SA and the resultant pressure will have a significant impact upon decision-making. Most aircrew will have, at some point, experienced a mission where the original plan has gradually collapsed. The pressure builds from a simple foundation of wanting to complete the mission (after all we are largely task focused) through to the perceived risk to life and limb. Back in the debriefing room, each decision is taken apart and it seems so obvious whether the decision was good or bad. So we should ask why this couldn’t be managed in the air? Well the good news is that there is a sound reason for this which is described in the following section. The subject of decision-making has been studied by psychologists, ­albeit not necessarily under exactly the same stresses as we would find in air combat operations. To understand how decisions are made it is necessary to consider both the brain functionality and the decision-making processes. Skills-based or perceptual-motor. Behaviours that have been learnt over time. These tend to cater for relatively fast and unconscious decision-making. Skill-based behaviours don’t consume many mental resources. An example would be flying the aircraft. These behaviours form the intuitive end of the decision-making spectrum. Rule-based decision-making is where defined responses are learnt in relation to given scenarios. For example, if condition ‘X’ is met, execute plan ‘Y’. Contrary to some expectations, these decisions are typically based upon pattern recognition with limited analysis. This type of decision process is quasi-rational (i.e. some cues can be processed analytically and others in a more automatic manner). You can probably see how the decision-making processes are rooted in different areas of the brain which makes it difficult to blur, for example, analytical thinking with rule-based decision-making as they are processed separately. However, all three areas are used simultaneously but the ­emphasis placed on each type is factored by stress, in particular time ­pressure and perceived risk. The latter is very significant as perceived risk invokes survival instincts which must be trained out in the combat aviator. It stands to reason that we want the aviator to make mission-based decisions that satisfy the Commander’s Intent for the sortie. As they respond to each system degradation, it is assumed that they will consider the Commander’s Intent in their response. This enables all participants to understand the role that they have in achieving the plan. NATO missions encapsulate the Commander’s Intent in the OPLAN and lower level briefs will usually contain a derivation of the SMEAC 5 paragraph order set10 outlining this intent as part of the Execution phase. In general, NATO’s doctrine and orders are excellent at providing what ­Pigeau and McCann11 define as explicit intent: this being the public statement of the aim within the confines of doctrine, orders, and tasking. This is modified by theatre specific data contained within rules of engagement, airspace coordination plans, ‘SPINS’ (SPecial INstructionS) and so on. This mass of data and procedures sets a frame of reference within which the pilot will make decisions in response to any change in the airborne environment. A second strand is what has become known as implicit intent. This is more concerned with the perceived expectations as to how operations should be conducted. This tends to be developed over a longer period and is ­often ‘absorbed’ as a cultural behaviour rather than one that is written down. An example would be remaining within the law of armed conflict. Farell and Lichacz12, show that implicit intent is open to interpretation based upon the role and experience of the subordinate. Within the ­military domain the implied intent will, unless specifically addressed elsewhere, include issues such as the degree of risk (both personal and mission) that the crew is expected to take. So, armed with a definite understanding of the Commander’s (explicit) ­Intent, and an appreciation of the implicit intent with which this should be managed, the crew are ready to go and commit aviation. Now this is where we need to consider that bit about how aircrew members think and make decisions. If we consider the situation of our crew participating in a NATO air oper­ation we can assume that they have been well trained in flying and fighting in their aircraft (skills-based training), have been exposed to scenario training through exercises whereby a variety of situations and responses have been shown (rule-based data). Finally, crews will have been briefed on theatre induction, rules of engagement and so forth (analytical data). ­Brilliant, what more could they want? We can assume that we can do little to affect core training. Therefore, we are only able to affect the rule-based and analytical decision-making processes. As a mission progresses from low-pressure ground preparation and transit phases into the more pressured operating area elements the bias of conscious decision-making shifts from being analytically to rule-based. Analytical decisions will still be made, perhaps relating the current ‘air ­picture’ to the mission briefing, but pressure is increasing the reliance on the ability to match cue ‘A’ with response ‘B’. This is where decision-making in degraded operations comes in. Under optimal conditions NATO aircrew would expect to benefit from a number of SA tools including the use of datalinks and secure communications. Data from long-range sensors and other tactical platforms will be displayed on the data link to augment their own-ship sensors. In general, we have become used to, if not dependent upon, a data and communications heavy environment. As we strip each of these away, the crew must react and, in general, the pressure will rise. Because of the environment will they be thinking log­ic­ally, dragging up pages from dusty volumes that they read some weeks ago? This cannot be assured. It is most likely that the crew will be reliant on quasi-rational decisions. That means that they will be mentally searching for a response that matches the cue in front of them, whether it is a go/no-go or an engagement decision. At present the Commander’s Intent is described with the following caveat: Its focus is on the force as a whole. Additional information on how the force will achieve the desired results is provided only to clarify the Commander’s intentions. A definite directive as to where and when bogeys and bandits should be prosecuted. This explicit intent would remove any doubt from the mind of the pilot. The last point at which untargeted bandits (‘leakers’) should be ­ engaged. What fire control order set should apply under what jamming conditions. How does the degradation of NATO capabilities change the Rules of ­Engagement. But, surely we already have all of this in the extant plans, policies and doctrine documentation for an operation? Well, by and large, yes we – but not always in a format that fits the way in which aircrew think, ­especially when aircrew are forced into rule-based decision-making. ­Framing the policies in terms of for situation ‘A’ perform ‘B’ would allow for crews to use data readily from Day 1 rather than developing such matrices for themselves as they become more experienced in the ­theatre of operations. Who has not experienced a debate on the Rules of ­Engagement or Commander’s Intent during the question and answer part of mission brief? Ever had a satisfactory decision at the end of such a debate? I am not so sure. Oh, and what about the ‘smart Alec’ in the debrief … just remember that he has the benefit of thinking analytically on the ground when you were reacting quasi-rationally in the air! 1. Mason, J. L Stress and Decision-Making: Avoid Expensive Mistakes. Forensic Magazine Dated 29 Oct. 2013. Internet resource accessed on 27 May 2016 at http://www.forensicmag.com/articles/2013/10/stress-and-decision-making-avoid-expensive-mistakes. 2. Hammond, K. R., Hamm, R. M., Grassia, J. & Pearson, T. (1987). Direct Comparison of the Efficacy of Intuitive and Analytical Cognition in Expert Judgement. IEEE Transactions on Systems, Man and Cybernetics, 17 (5), p. 753-767. 5. Roscoe SN, Jensen RS, Gawron VJ. Introduction to Training Systems. Ch in Aviation Psychology. Roscoe SN (Editor). First edition, Ames: Iowa State University Press; 1980: p. 173–181. 6. Klein, G., & Klinger, D.(1991). Naturalistic Decision-Making. CSERIAC Gateway, 2 (1), p. 1–4. 7. Hammond, K. R. (1988). Judgement and Decision-Making in Dynamic Tasks. Information and Decision Technologies, p. 14, 3–14. 8. Rouse, W. B., & Valusek, J. (1993). Evolutionary Design of Systems to Support Decision-Making. In G. A. Klein, J. Orasanu, R. Calderwood, & C. E. Zsambok (Eds. ), Decision-Making in Action : Models and Methods. Norwood, NJ : Ablex Publishing. 9. NATO (2010) AJP-01 – Allied Joint Doctrine. 10. SMEAC = Situation, Mission, Execution, Administration and Command /Signal. This is the common application at unit level (see for example US Army Field Manual 5.0). Within the NATO HQ planning domain the acronym Situation, Mission, Execution, Service Support and Command Arrangements is strictly more appropriate (see AJP-01(D), paragraph 0549). 11. Pigeau, R. and McCann, C. (2000) Redefining Command and Control. In: R. Pigeau and C. McCann, (eds.) The Human in Command: Exploring the Modern Military Experience, 2000, New York, NY, USA: Academic/Plenum Publishers, pp. 165–184. 13. NATO (2010) AJP-01 – Allied Joint Doctrine.